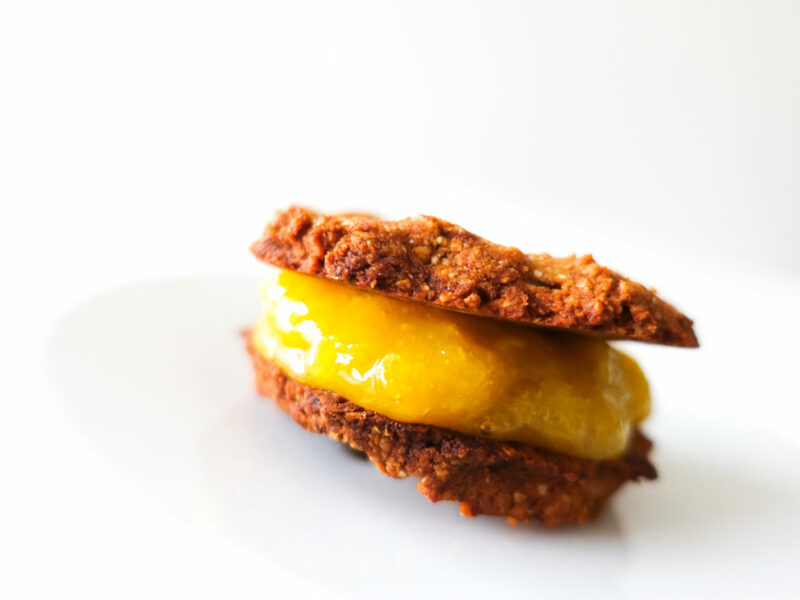 Lemon Pie Cookies - paleo - NOURISH TO PERFORM. 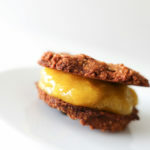 If you already couldn’t get enough of my lemon orange tart, then these lemon pie cookies are for you! The cookies only require 4 ingredients, are paleo and vegan and easy to make. Filling them with lemon curd gives you the illusion of having a lemon tart but don’t worry – if you don’t like lemons, then just add fill your cookies with nut butter, a chocolate frosting or some yoghurt. Whatever you like! Mix all ingredients with 120ml water or nut milk./Alle Zutaten vermengen und mit 120ml Wasser oder Nussmilch verrühren. Form 12 cookies on a baking sheet on a baking tin and bake your cookies until golden for about 15 minutes./12 Cookies auf einem Backblech mit Backpapier formen und die Cookies für etwa 15 Minuten goldig braun backen. Place all ingredients for the lemon curd into a pan and whisk them all together. Turn on the heat and whisk your lemon curd continuously whilst cooking on medium heat until thickened./Die Zutaten für den Lemon Curd in einem Topf vermengen und dann erhitzen. Bei mittlerer Hitze unter ständigem Rühren kochen bis er eindickt. Put the lemon curd into a bowl and chill in the fridge until thick and creamy before putting together your cookie sandwiches./Den Lemon Curd in einer Schüssel in den Kühlschrank geben bis er cremig und dickflüssig ist. Dann die Cookie Sandwiches zusammensetzen.